In high school, Colt planned on joining the Army, or maybe working for a construction company, anything except working to avoid working in the coal mines, A lot of families in his community have worked as miners.. When he was in high school, he saw many miners lose their jobs- including his stepfather. Despite the economic challenges, he wants to stay in West Virginia to be close to his family, especially his 7-year-old brother, River. It’s been a struggle for Colt to find a way to stay in West Virginia. Colt Brogan drives me along the Coal River in a 1996 Geo Tracker. It’s May, 2016, one of our first interviews together. Every curve of this road has some significance for Colt. As we travel along the river, I learn all the stories that connect him to Lincoln County, all the things he loves, and hates, and all the memories that make him feel he has to stay. Even though a part of him wants to leave. As a kid he walked miles down this road. During summers, he spent more time outside than at home. This story is part of the Struggle To Stay series. Reporters have spent 6-12 months following the lives of 6 individuals as they decide if they will stay or leave home - and how they survive either way. On the hills to our left, we pass nice brick houses, with big, well landscaped nicely mowed lawns. Those houses, says Colt, are where the rich people live. The other side, the one that floods almost each spring, is where the river people live. Colt doesn’t live along the Coal River anymore. Now he rents a small, two bedroom house in Hamlin, the county seat. But his real home will always be along this river. At one point along the drive, Colt points out one of his favorite spots along the river- or was when he was a kid. We drive a little more through washed out parts of the road until we park at one of Colt’s favorite swimming holes. A giant oak tree hangs over us, as we stand on a narrow beach beside the green river. Two kayakers paddle by. Colt says everything changed in this community about ten years ago, when drugs like prescription pills, and then meth and heroin- started becoming more common. “And it was almost scary to see that change. To see, what I feel, was the drug epidemic changing the nature of the people to what they are today," Colt says. After we get back into his Geo Tracker, we drive past small homes, dog kennels, a chicken coop. Colt doesn’t slow down as we pass his mom’s home. He keeps his eyes on the road. Colt and his mom haven’t been getting along for years, but things came to a head when he stopped by her house for a visit a few days before this interview. They got into an explosive argument over money, he says. She wanted him to pay the taxes on a property she’d given him next door. He said he didn’t want the property because it floods all the time. For years, Colt says his mom has repeatedly tried to get money from him. This time, he told her no. Colt tells me his mom has struggled with drug addiction since he was a little kid. Later, I asked his mom if this is true. She says addiction is something from her past. It's how she dealt with abuse she's experienced from men in her life. As for this fight over money, she says she was angry that Colt wouldn’t help pay the taxes, but that she didn’t throw him out of the house. Colt moved out of the house two years ago, just four days before his 18th birthday. He doesn’t look sad when he talks about it. He’s angry. We turn around. And this time he does slow down as we pass his mom’s house again. There’s a nativity scene, surrounded by blooming flowers. That green thumb that Colt inherited from his mom? He says it’s what’s keeping him here in West Virginia. Because he’s in a training program that’s teaching him agriculture and helping him go to college. But will farming pay the bills after his two years in the program are up? And in the meantime, how is he going to juggle a full-time job, school, and the stress of his turbulent relationship with his mother? Because things do change between them over the next year. Well, kind of. We'll hear more on that next week on The Struggle to Stay. Music in this story is by Marisa Anderson. 20-year-old Colt Brogan always found it easy to make fairly good grades in school. As a kid, he’d dreamed of being an architect. But that changed. Around the time when he was a junior in high school, Colt decided college wasn’t for him. “It felt too unpredictable. I thought, dealing drugs is safer than going to college. That’s the God’s honest truth,” says Colt. 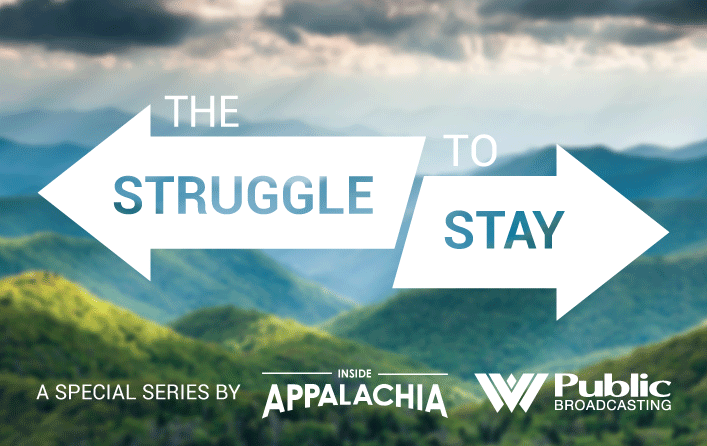 Does Holding on to Appalachian Traditions Matter? In this episode of Inside Appalachia, we take a road trip to explore stories of people who are reviving Appalachian traditions, like baking salt rising bread or making sorghum sweeteners. Some folklorists, artists and educators are wondering what the future of traditional arts in the country will look like. On Friday, the West Virginia House of Delegates approved a bill that would eliminate the state's Secretary of Education and the Arts and reorganize several of the departments the position oversees. Most of those departments oversee cultural and arts programs like the state archives, the state museum, the annual Vandalia music gathering and West Virginia Public Broadcasting. The bill still needs to be approved by the state Senate to take effect. A team of journalists from West Virginia Public Broadcasting have been selected to attend NPR’s first-ever Audio Storytelling Workshop. The Audio Storytelling Workshop is where public media creators will bring their ideas to D.C. for three days of planning, training and collaborating. WVPB’s project will focus on the economic crisis facing West Virginia and the decision by families here to stay or go. The team includes Roxy Todd (Reporter and Producer for Inside Appalachia), Glynis Board (Reporter) and Crystal Collins (Digital Editor/Producer). It can be hard to live in West Virginia - especially now. Hear us discuss why we stay, despite the struggle. Also, a retiring lawmaker recites a moving poem about living in flyover country, in response to a degrading tweet from Daily Show host Trevor Noah.